Revitalise and hydrate all skin types with the Cremorlab T.E.N. Fresh Water Gel Special Edition Set. 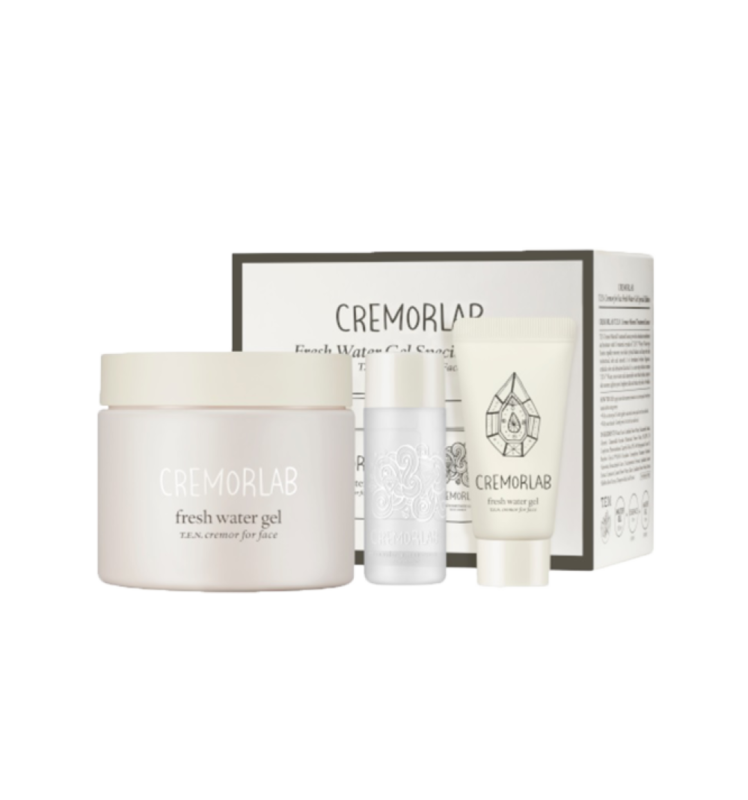 Featuring a full-size Fresh Water Gel as well as a free travel-size gel and Mineral Treatment essence, this set is a perfect introduction into the world of Cremorlab. Rich in T.E.N Water, and Vitamins A, C, B1 and B2, Fresh Water Gel gel promotes hydration while protecting against moisture loss, and encouraging a supple, soft, plump complexion. The Mineral Treatment Essence works to restore your skins suppleness and natural moisture balance. Infused with T.E.N. and rich in minerals, this essence refines skin texture and brightens. T.E.N. is the foundation of all of Cremorlab's products. Made from a rare and mineral-rich thermal water, the liquid works to improve hydration and the health of your skin, helping to boost radiance, vitality, and moisture levels. This gel facial moisturiser has a lovely matte finish, and is suitable for all skin types. The lightweight texture makes it perfect for hot, humid weather, making it the perfect moisturiser for the hotter months. Fresh Water Gel: Water, Glycerin, Cyclopentasiloxane, Butylene Glycol, Dimethicone, Pentylene Glycol, Camellia Sinensis Leaf Extract, Hamamelis Virginiana (Witch Hazel) Water, Orchid Extract, Rose Flower Oil, Glycine Soja (Soybean) Oil, Lavandula Angustifolia (Lavender) Water, Yeast Extract, Portulaca Oleracea Extract, Glycyrrhiza Glabra (Licorice), Root Extract, Rosa Canina Fruit Extract, Centella Asiatica Extract, Hordeum Vulgare Extract, Aloe Barbadensis Leaf Extract, Chamomilla Recutita (Matricaria) Flower Extract, PEG-40 Hydrogenated Castor Oil, Silica, Cetyl PEG/PPG-10/1 Dimethicone, Methyl Methacrylate Crosspolymer, Sodium Glutamate, PEG-10 Dimethicone, 1,2-Hexanediol, Algin, Phenyl Trimethicone, Hydrogenated Lecithin, Polysorbate 60, Alcohol Denat., Phenoxyethanol, Sodium Benzoate, Potassium Sorbate, Benzyl Alcohol, Dehydroacetic Acid. Mineral Treatment Essence: Water, Rosa Centifolia Flower Water, Niacinamide, Chamomilla Recutita (Matricaria) Flower Water, Saccharomyces Ferment, Aspalathus Linearis Extract, Lilium Candidum Flower Water, Centaurea Cyanus Flower Water, Paeonia Albiflora Root Extract, Diospyros Kaki Leaf Extract, Glycerin, Betaine, PEG/PPG-17/6 Copolyme, Caprylyl Glycol, PEG-40 Hydrogenated Castor Oil, Butylene Glycol, PVM/MA Decadiene Crosspolymer, Potassium Hydroxide, Adenosine, Biosaccharide Gum-1, Phenoxyethanol. Apply after cleansing and follow with Fresh Water Gel, massaging it into the skin.